Midland has always thought of itself as a small town, but an oil boom is rapidly reshaping the area. Housing as expensive (and hard to find) as New York City's has become the norm, and the strain is evident on schools and roads. MIDLAND — In the desolate outskirts of this thriving West Texas oil town, two men recently showed off a new, 400-square-foot wood cabin they hope to rent out for $1,500 a month. A planned expansion includes spaces for 30 recreational vehicles and nine additional cabins — and maybe more. “This morning the boss man was asking if we could duplicate this across the fence,” said Danny Wallace, who works for Jones Bros. Dirt & Paving Contractors, the company developing the site. Housing as pricey as New York City’s has become the norm in Midland, amid an oil boom that is rapidly reshaping the area. Buoyed by world demand and events in the Middle East, oil prices are hovering above $80 a barrel, more than double their level of early 2009, and workers have flocked here from elsewhere in Texas and the nation, lured by jobs working on rigs or driving trucks. But the resulting housing shortages, traffic and strain on schools has some residents shaking their heads. “I was born and raised here in Midland, and it’s never been like this,” said Kenney DeLaGarza, a building inspector for the city, as he stood on a gravel road beside a patch of land covered with RVs. Fields where his parents once took him to shoot fireworks, he said, have turned into housing developments — sometimes with pumpjacks in the backdrop. 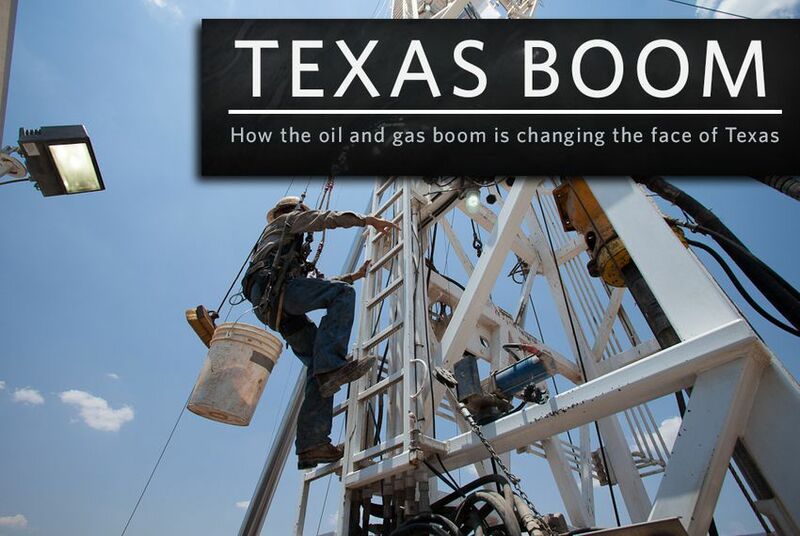 Booms — and busts — have been a way of life here since oil began flowing from Permian Basin wells in the 1920s. Midland is where George H.W. Bush and George W. Bush made their names in oil. The current mayor, Wes Perry, is also an oilman who sometimes takes calls about city matters from his EGL Resources office. Today the Permian Basin accounts for 14 percent of the nation’s oil production. That is far more than the combined output of other Texas fields, including the Eagle Ford Shale, and more than the Bakken shale in North Dakota, another major drilling region. This latest boom has been driven by hydraulic fracturing, or fracking, the technique of shooting water, sand and chemicals deep underground to crack hard rock and release oil. (The Permian Basin also produces natural gas, but some gets flared off partly because of a pipeline shortage.) Fracking has enabled drillers to produce more oil than ever before, although the wells are more expensive, according to Tommy Taylor, the drilling manager with Fasken Oil and Ranch, an oil company that is building a new headquarters office on Midland’s northwest edge. Also, fracking’s demand on aquifers has added to the deep concerns about water availability in a region so parched that oilfield trucks can kick up clouds of dust that look like smoke. Amid the resurgent drilling, Midland officials estimate that the city’s population has swelled by about 8 percent in the last two years, to about 120,000. There is talk of eventually hitting the 150,000 mark. Unemployment in Midland in May stood at just 3.8 percent — the lowest for a metro area in the state — followed by nearby Odessa at 4.3 percent. The oilfields offer generous pay, starting around $15 an hour, Taylor said. That leaves other businesses scrambling for workers. Along a half-mile stretch of the Andrews Highway, an artery through the heart of Midland, “Help Wanted” signs are ubiquitous — at Long John Silver’s, Pizza Hut, Wendy’s, Whataburger, CVS and the Way Out West Steak & Buffet. “If you can’t get a job in Midland, Texas, you’re not going to make it,” said Jack Naumann, a geologist who has lived in Midland since 1969. Even as more workers come, there is no guarantee they can find housing. That is why Wallace’s company is building the two-bed cabins and renting out trailer spaces with utility hook-ups. Jones Bros., whose products include crushed limestone, is thriving. (“We sell everything we can crush,” Wallace said.) But it struggles to find places to house prospective workers, who call about jobs from as far away as Indiana. “We have to tell them we’ve got the work, but we’ve got a problem with living conditions,” Wallace said. He plans to reserve some spaces in the new development for Jones Bros. workers and rent out the rest; a Craigslist ad, placed in late June, plus word of mouth yielded at least 50 calls over two weeks, mostly for the RV spaces, he said. Besides subdivisions, cabins and RV parks, which are sometimes dubbed “man camps,” hotels are rapidly going up. On Midland’s western edge, near the ballpark that is home to Midland’s minor-league RockHounds baseball team (which projects record attendance this year), four hotels are being built or expanded, essentially within sight of one another. At the Sleep Inn, workers are rushing to complete a new wing ahead of a major oil convention in October. “All the rooms that you see are rented,” said Dwayne Felker, a worker with Shell Craft, a construction company, speaking in the still-skeletal interior above the sounds of hammering and clinking. The hotels and other new developments could even start to meld Midland and Odessa, which lie just 20 miles apart but vie with each other on and off the high school football field. “Modessa — it’s going to happen eventually,” said DeLaGarza, who does frequent inspections at a vast new subdivision near the ballpark. Some existing neighborhoods are wrestling with a different issue: nearby drilling. Over the past 18 months the City Council has approved more than a dozen permits for drilling within city limits, and at least eight more are up for consideration in the next two months, according to John James, a councilman. Only a few have been rejected — one of them in the northwest Midland neighborhood of Craig Tellinghuisen, a retiree who worked in the oil business decades ago. A surge in roadway accidents has raised concerns regionwide. A recent report from the Midland-Odessa Transportation Alliance found that the traffic fatality rate for the Permian Basin area in 2010 was 2.5 times higher than in the rest of the state — and crashes and deaths have only climbed since. “We’re very concerned,” said James Beauchamp, the president of the alliance, which launched a “Drive Smart” campaign last week, with notices online and around town. In one especially awful week in June there were nine fatalities, he said. Even schools are feeling the strains of the boom. The Midland Independent School District has about 22,500 students and is adding about 750 a year, according to Superintendent Ryder Warren. The district plans to seek a bond issue that will probably include money to build three new elementary schools, Warren said. Meanwhile, dozens of portable classrooms have been set up. All the challenges have some people wondering when the boom is going to end, or at least ease. Long-time Midlanders say a bust is inevitable — it is just a matter of time. Oil prices have fallen more than 20 percent from their highs of around $110 per barrel in February. Taylor of Fasken said that the recent price drop has already had an impact, and that for fracking — an expensive process — to continue, the economics must work out.